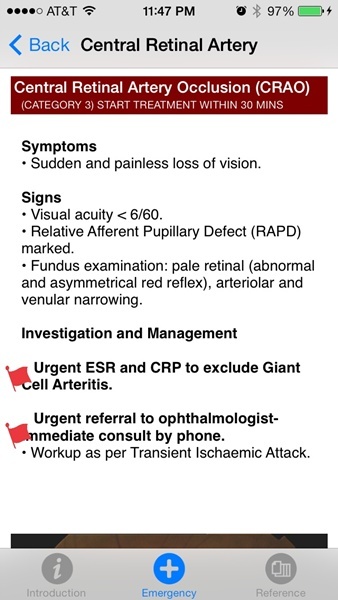 Eye Emergency Manual is reference tool for emergency department physicians when facing ophthalmic emergencies. Although its purpose is specifically to help those in New South Wales, the state’s department of health has created a medical app that is useful worldwide. The app itself states the information provided is not strictly evidence based. Instead, it has come from the consensus opinion of an expert working group. Therefore, it is especially important for those outside of New South Wales to use the app only as a general guide. The Emergency section of the app is broken down into three broad categories for chief complaints. Each category is broken down into a list of potential causes with an overview at the top for the non-trauma sections. 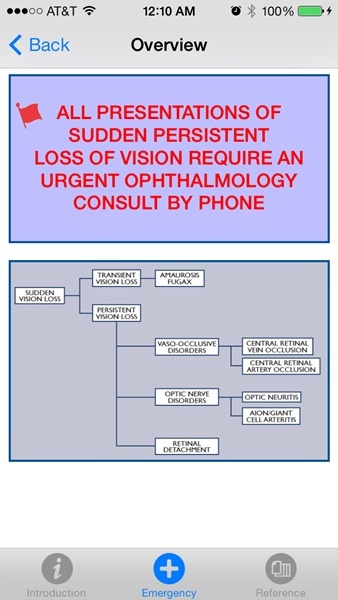 The overviews provide flow charts that further breakdown the potential cause of the patient’s complaint. Although the breakdown is logical, it can be difficult to find the correct cause of the patient’s symptoms without reading through multiple pages. It would be nice if the app interactively walked through the flowchart based on the clinician’s input during the examination of the patient. Once the user has drilled down to a specific cause, the sections contain recommended time frames to initiate treatment as well as red flags for urgent situations including emergency consults and referrals. 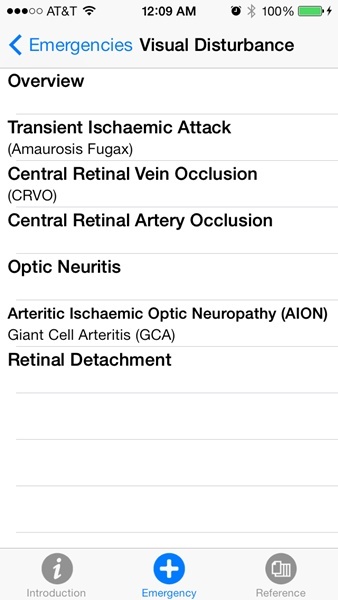 In addition, the app includes a Reference section that includes anatomy and ophthalmic workup sections. 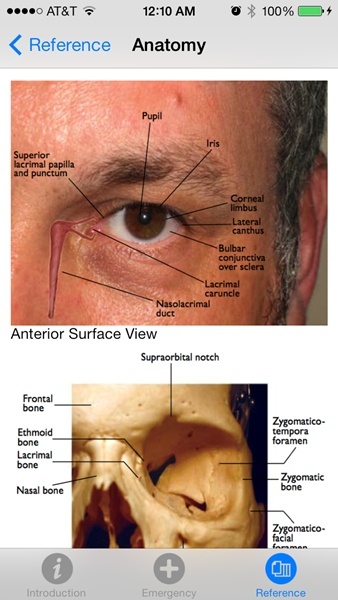 The anatomy section provides a few basic photos and diagrams for a quick anatomy review. 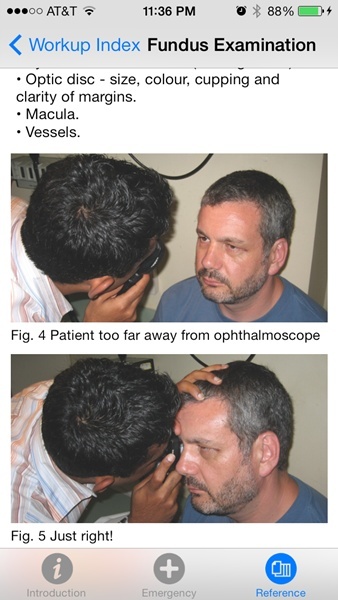 The ophthalmic workup section has a nice high-level review of the entire ophthalmic exam as well as detailed sections for each aspect of the exam and treatment. 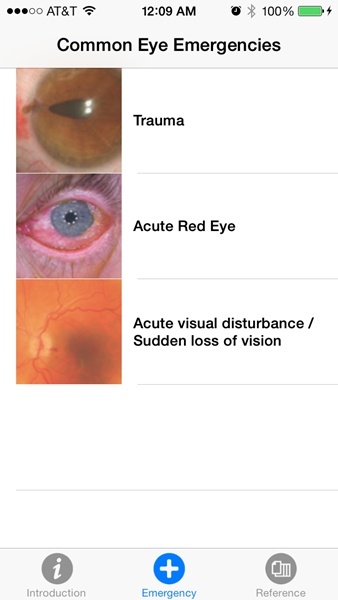 Eye Emergency Manual is useful app for emergency care providers facing an ophthalmic problem. It provides detailed information regarding the ophthalmic exam as well as signs, symptoms, and treatment of specific conditions. Although the interface could be improved to be more useful in diagnosis, it is still a good interface as a reference tool. Also available for Android. Is there a bias here for one particular platform? Awesome, I tried it out on Android just now — looks the same on that, so I wouldn’t say we’d have a preference for it to be used on Android vs Apple. Thanks for pointing out it’s available for Android, unfortunately many innovative and new medical apps aren’t. Great to have an App1 I have the paper version and it is really useful. Can highly recommend for students!